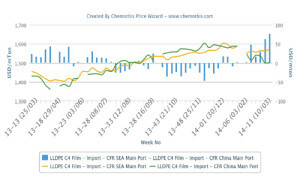 According to ChemOrbis, players report more offers for Chinese origin and re-exported PP cargoes from China in Southeast Asian markets where prices moved higher this week. Discouraging post-holiday demand in China is blamed as the main reason for sellers looking to divert their cargos from China to other countries including India, Vietnam, Indonesia and Myanmar in an attempt to obtain better netbacks. 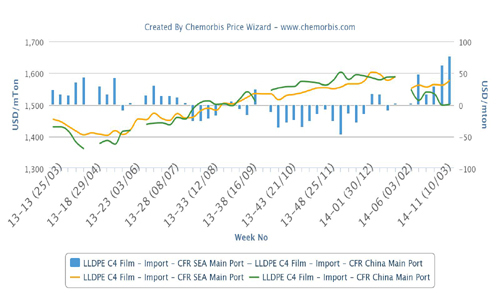 In Indonesia, a woven bag manufacturer reported that Chinese coal based PP was offered into the market. He heard from a trader that they managed to sell 800 tons of this coal based PP raffia because buyers in Indonesia need to meet their requirements for their export orders while local supply is tight. The converter commented, “If the coal based material will have the same quality as the conventional production methods then it may grow its market share in Southeast Asia.” A woven bag converter reported purchasing some re-export Saudi Arabian cargos from a trader as local supplies remain limited in Indonesia. Meanwhile, Southeast Asian buyers started to go to the sidelines considering lower crude oil prices, according to a trader in Myanmar who was offered Saudi Arabian homo PP raffia and injection out of China. “Some traders are asking customers for their bids for re-exported materials,” he said.